Extraordinary crimes against the people and the state have to be avenged by agents extraordinary. Two such people are John Steed (Patrick Macnee), top professional, and his partner, Emma Peel (Diana Rigg), talented amateur. Otherwise known as, The Avengers. 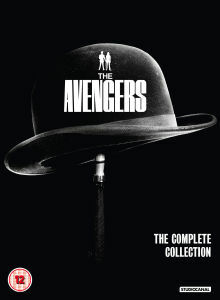 This boxset includes the complete and uncut Series 4, on Blu-ray™ for the first time with a wealth of special features. Exclusive audio commentaries with: director Roy Ward Baker and scriptwriter/producer Brian Clemens on The Town of No Return, scriptwriter Robert Banks Stewart on The Master Minds, scriptwriter Roger Marshall on Dial A Deadly Number, director Gerry O’Hara on The Hour That Never Was and director Don Leaver on The House That Jack Built. The jewel in British television's crown! Wonderful characters and superb dialogue and scripts. This superb series is beautifully presented here. Absolutely magnifocent! Still seems to be a glitch with The Gravediggers episode about 1 minutes 47 seconds in the very top of the picture has a fault very similar to what might happen with video tape. Otherwise very much enjoying this series. The picture and sound has never been better, and this new release is worth every penny. The clarity of the picture is stunning for something 50 years old. Buy with confidence! Just received my copy and wow, fantastic picture , pin sharp and masses of detail, ( average bit rate of about 20Mbps ) no colour cast and crucially absolutely no raised audio pitch or speed up, everything sounds exactly right and Steed and Emma sound vocally perfect conveying all the atmosphere of the episodes. If anyone is hovering on buying this release, don't , just get it ordered, it's spot on , you wont get a better copy! Really hope that series 5 will follow quickly and be equally perfect in terms of picture and audio pitch!